Time: 6 hrs. 45 mins. The Missouri Gulch trail is located in the Collegiate Peaks Wilderness Area of the San Isabel National Forest between Leadville and Buena Vista, Colorado. The trail provides access to three of Colorado's 14ers, or peaks that are over 14,000 feet of elevation, Mount Belford (14,197), Mount Oxford (14,153) and Missouri Mountain (14,067). Scores of climbers hike the trail every year to climb the peaks. Many of them are seeking to complete all 53 or 54 (depending on whose list you are using) of Colorado's 14ers. Since climbing all 3 of the peaks in the Belford Group makes for a very long and trying day most people choose to backpack up the Missouri Gulch trail and camp near treeline and climb the peaks over a 2 day period. 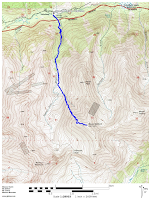 For this post we are hiking the trail and climbing Mount Belford and then hiking back out the same day. To get to the Missouri Gulch trailhead drive south out of Leadville on Highway 24 for about 19 miles, or 15 miles north of Buena Vista, and turn west onto County Road 390. Follow CR 390 for about 7.7 miles to the trailhead. The road is passable by passenger cars but it can be washboardy and have a lot of potholes during wetter years. Camping isn't allowed at the trailhead but there are a few places to camp along CR 390 as well as a campground at Clear Creek Reservoir. From the trailhead immediately enter the Collegiate Peaks Wilderness Area and cross Clear Creek on a good bridge. After crossing Clear Creek the trail begins climbing at a moderate slope. A series of switchbacks quickly lead the trail above the 10,000 foot point and beyond. If you notice the slope of the mountainside in the picture that the trail is cutting across then you can get a better appreciation for how steep it is. Once above the switchbacks the trail levels off a little and makes a bridgeless crossing to the east side of Clear Creek. As the trail continues climbing up Missouri Gulch on the east side of Clear Creek it passes the remains of an old cabin around the 1.5 mile point and comes out into the open around 1.7 miles. From here the zigzag trail that climbs up the northwest flank of Mt. Belford (14,197 feet) can be seen. A little further along and Missouri Mountain (14,067 feet) comes into view on the west side of the valley. When we first arrived everything above about 13,000 feet was covered in snow but most of it melted quickly as the day wore on. The Missouri Gulch trail comes to an end at the 2.2 mile point where it meets the Elkhead Pass trail which provides access to Missouri Mountain. The branch of the trail that forks off on the left leads up to Mt. Belford and Mt. Oxford (14,153 feet). For this post we are going to continue to the summit of Mt. Belford before turning around. From the trail junction it is about another 1.7 miles to the summit of Mt. Belford and a little more than 2,500 feet of elevation gain. After hiking up the rocky outcrop at the base of the mountain the trail begins a steady climb via a series of short switchbacks that work their way up the grassy shoulder. About a third of the way up the grassy slope gives way to a rockier segment of trail that varies between long traverses and more switchbacks. The trail reaches a ridge around 13,900 feet where the first good looks to the south come into view. One more final grunt of effort leads to the rocky summit of Mt. Belford some 300 feet higher. In the background of this photo Mt. Oxford can be seen. On our previous trip to the Belford Group some 15 years ago we continued on to Mt. Oxford and then bagged Missouri Mountain on the way back. We had already climbed Huron Peak the same day we began our hike up Missouri Gulch. All 4 peaks together took over 24 hours to climb with us reaching both Belford and Oxford in the wee hours of the night. On this trip there were gale force winds blowing. The wind was so strong that we had to hold onto the rock and couldn't stand up on the summit. The windchill felt like it was below zero. It was at least cold enough to freeze the hoses on our camelbacks. The previous weekend on the Rock of Ages trail we were in our shirt sleeves above 13,000 feet and 2 days later we were similarly attired at Ice Lakes above 12,000 feet. Be prepared for the worst and hope for the best. The views from the top make it all worthwhile. Many of the peaks were shrouded in clouds but we could make out Mt. Harvard, Columbia, Huron Peak, Missouri, Oxford, La Plata and portions of Mt. Elbert. On a clear day there are a lot more 14ers visible. When we had arrived at the Missouri Gulch trailhead we took the last remaining parking spot. As near as we could tell everyone else that climbed any of the peaks had backpacked in and we were the only ones that were making a day hike of it. 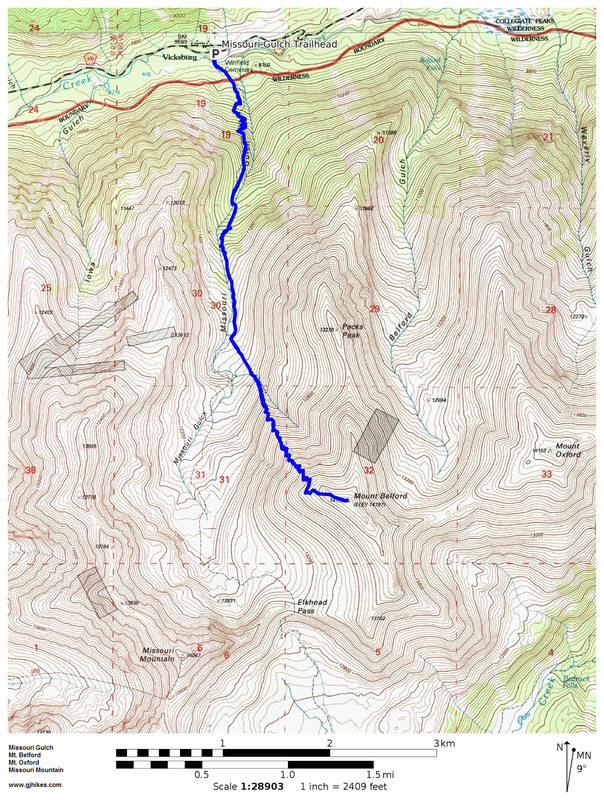 Our plan is to come back another time and hike Oxford via the Pine Creek route. Since we have already bagged our 14ers, some 4-5 times, we are now having fun exploring other trails. After all, there are only 53-54 14ers in Colorado but there are thousands of great trails to hike. Missouri Gulch is one of the trails that will really test your legs. If you would like to see it for yourself then all you have to do is 'Take a hike'.